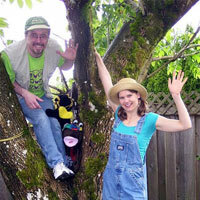 About The Artist: Down By The Docks have been entertaining children at Libraries, Festivals, Schools and private concerts for the past ten years. This high energy group brings a new dimension to storytelling using songs, tales and jokes for their presentations. Some past themes include “Sail Through Time” (exploring past civilizations while traveling on a pirate’s ship), “3-2-1 Blast Off” (a show about going into space), “The Wizard of Books” (all about the Library and how cool books are), “Sounds In Your House” (how you can use any object to create music), “The Mystery of the Missing Book”, “The Art of Sound” and an audience favourite “Laugh With Leroy”, as the group examines what makes people and creatures laugh. All Down By The Docks performances usually run about 45 minutes to an hour in length. You’ll have claws of fun with Down By The Docks where the land, sea and air meet!